How to use PDF to ePUB? 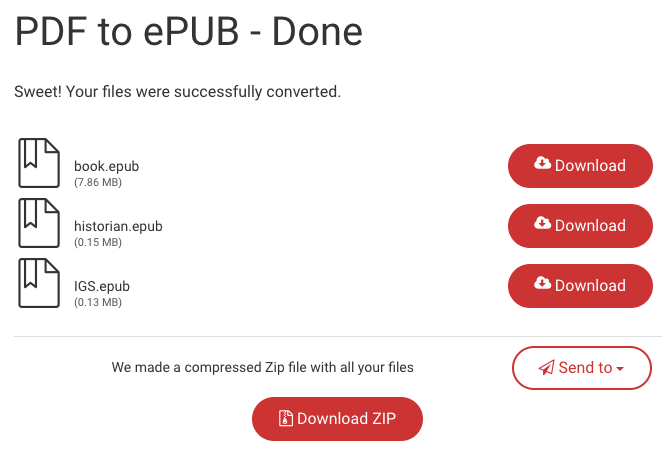 The PDF to ePUB converter enables you to convert PDF files to an ebook reader compatible format ePUB. You will then be redirected to the download page where you can download the converted ePUB files once processed. The file names refer to the original file name (origfile.ePUB). Simply click on Download to download each file. Note that you need to be logged in with an account to be able to download files. If you do not have an account, you can sign up for one and download your file right away.